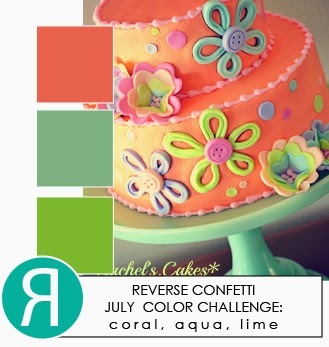 A card for the July Reverse Confetti Color Challenge and the Cutting Edge Challenge #5! I absolutely love this colour combination. I am really excited to share my new friend with you, I think that IT going to be a bestie! My tripod! We have had our tripod as long as the camera, maybe longer. My father in law passed it on to us and I have never taken the time to learn how to use it. I hear all the time what a difference it makes. Although I don't think my photos were horrible, what they lacked was clarity. I am going to have to continue to work with it, but I think I am on to something. What do you think, do you use a tripod? I am also submitting this to The Cutting Edge Challenge #5. I was drawn to the summertime theme of Melania's card and her fresh and clean card design--lots of white space. On the weekend my husband and I tried out our new Margaritaville Frozen Concoction Maker. He has wanted it for some time and when I saw it on sale last week for a great price I decided to pick it up. Definitely going to be some fun! Here is our first attempt at Margarittas, just traditional lime this time--Yum! Your photo is crisp and gorgeous. I just bought a new camera yesterday but don't have tripod. Thought about it when I was in the camera store! Love your card...adorable and goes perfectly with the new magarita maker. 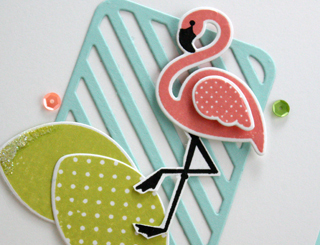 Such a FUN card Tracey...love how you teamed up the flamingo and the limes! Your card is so cute and your photo looks great. I don't have a tripod but maybe I should get one. Loveeeeeeee this! LOVING the limes and the flamingo!!!!! Wow. I want one! That sentiment would be great for the new Top Dog Dies too! CUTE flamingo! totally adorable card.. love that flamingo and great color combo..
Just love this Tracey, the sentiment is so perfect...can I come round for drinks!! Your card looks like it could have come from Margarita-ville!! Very cute Tracey, love the wee bit of sparkle! 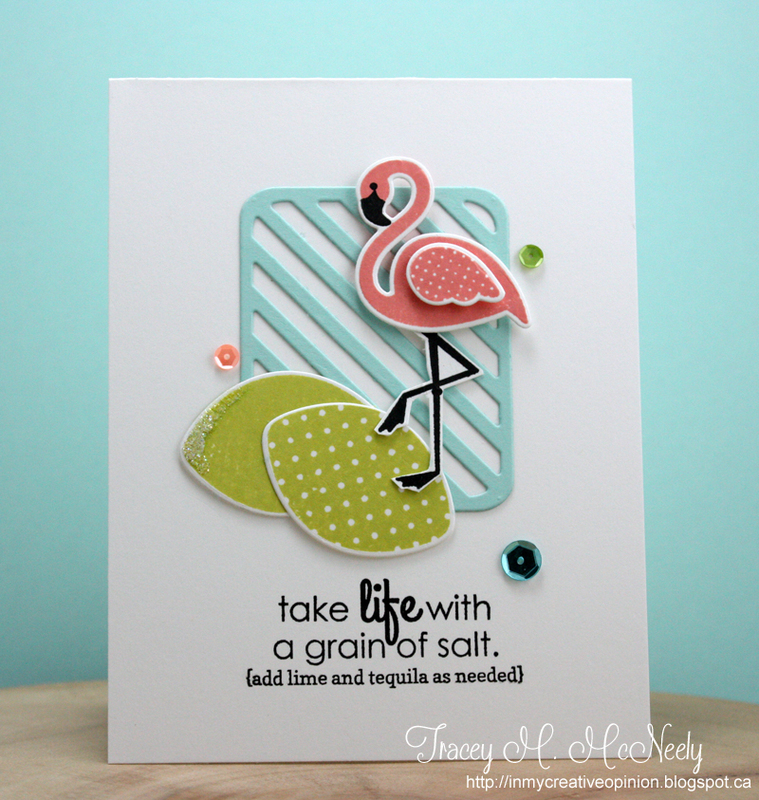 Love your CAS design and wonderful sentiment, Tracey...your Flamingo is such a fun element, too! Looks like you and hubby are going to enjoy your new 'toy'...have fun!!! Great combination of elements. Thanks for joining us at The Cutting Edge Challenge! Pass the margarita! Lol. Super cute card, love the salted limes and fun flamingo. Those colors are just gorgeous together and your totally make them rock! I love your sweet flamingo too, and that sentiment is so perfect. Very cute card. Love that flamingo and those colors are so very yummy. Now, I see why you were so busy last weekend. Great new toy. No, I do not have a tripod. Another thing to put on my wish list, I guess. Oh, your card is so adorable, Tracey! Love all the die cuts and great sentiment. Pretty cool looking margarittas too! Well, I don't need to tell you how much I adore this card!!! It has my flamingo in i! haha! I seriously love this though! The addition of the limes and that cute sentiment are perfect!! Tracey, how totally amazing your flamingo card is; in fact, it's causing me to swoon, which is pretty impressive given that typically it's butterflies who cause that response! The die cuts you've combined make for one yummy, CAS, crisp, fabulous car! Love that bit of glitter around the lime! Ultra amazing, my friend! Your margarita concoction maker looks mighty delicious, too. I'm not much for margaritas (I might be convinced if you made me one *grin*), but a glass of red wine...happy sighhh... Another visit that has me smiling! love this card and color combo! I have to get these stamps! What a wonderful card, Tracey!! I LOVE the crisp look and wonderful colors in your card...your design is amazing, as well...LOVE!! Mind. Officially. Blown! Tracey, you always manage to create something that makes me happy, but this just put me over the edge of happiness!! Love those sweet summery colors and the clean lines of your design - you, my friend, are BRILLIANT! Thanks so much for playing with us at the Cutting Edge Challenge - we're so glad you did!